Using the GEMINI framework begins by loading a VCF file (and an optional PED file) into a database. 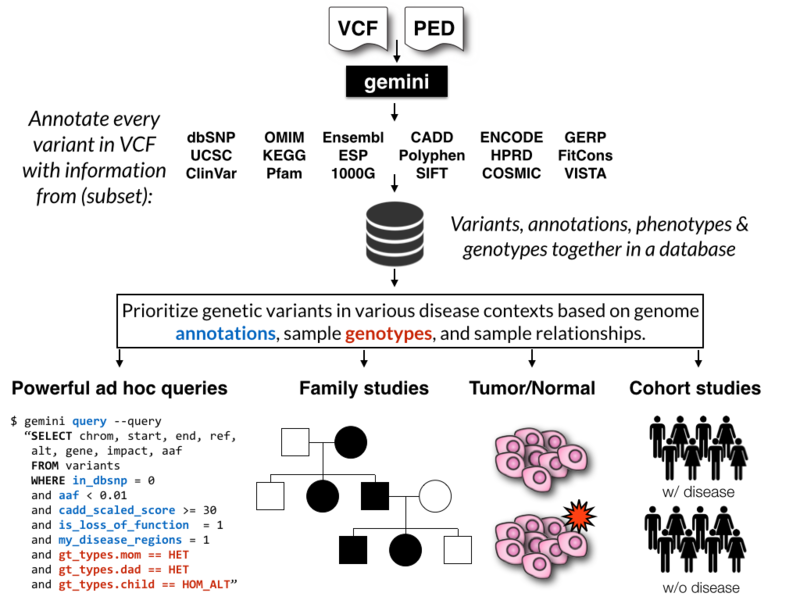 Each variant is automatically annotated by comparing it to several genome annotations from source such as ENCODE tracks, UCSC tracks, OMIM, dbSNP, KEGG, and HPRD. All of this information is stored in portable SQLite database that allows one to explore and interpret both coding and non-coding variation using “off-the-shelf” tools or an enhanced SQL engine. Please also see the original manuscript. GEMINI solely supports human genetic variation mapped to build 37 (aka hg19) of the human genome. GEMINI is very strict about adherence to VCF format 4.1. For best performance, load and query GEMINI databases on the fastest hard drive to which you have access. In addition to the documentation, please review the following tutorials if you are new to GEMINI. We recommend that you follow these tutorials in order, as they introduce concepts that build upon one another. then run the installation commands above. As of version 0.16.0, the built-in Mendelian inheritance tools are more stringent by default (they can be relaxed with the --lenient) option. By default, samples with unknown phenotype will not affect the tools, and strict requirements are placed on family structure. See the the docs for more info. In addition, the inheritance tools now support multi-generational pedigrees. As version 0.12.2 of GEMINI it is required that your input VCF file undergo additional preprocessing such that multi-allelic variants are decomposed and normalized using the vt toolset from the Abecasis lab. Note that we have also decomposed and normalized all of the VCF-based annotation files (e.g., ExAC, dbSNP, ClinVar, etc.) so that variants and alleles are properly annotated and we minimize false negative and false positive annotations. For a great discussion of why this is necessary, please read this blog post from Eric Minikel in Daniel MacArthur’s lab. Essentially, VCF preprocessing for GEMINI now boils down to the following steps. If working with GATK VCFs, you need to correct the AD INFO tag definition to play nicely with vt .
Decompose the original VCF such that variants with multiple alleles are expanded into distinct variant records; one record for each REF/ALT combination. Normalize the decomposed VCF so that variants are left aligned and represented using the most parsimonious alleles. Annotate with VEP or snpEff. A workflow for the above steps is given below. # decompose, normalize and annotate VCF with snpEff. Importing VCF files into gemini. Selecting sample genotypes based on “wildcards”. --gt-filter Wildcard filtering on genotype columns. --format Reporting query output in an alternate format. What if I don’t see my gene in the database? Does GEMINI work with non-human genomes? What versions of the human genome does GEMINI support? How can I use PLINK files with GEMINI? 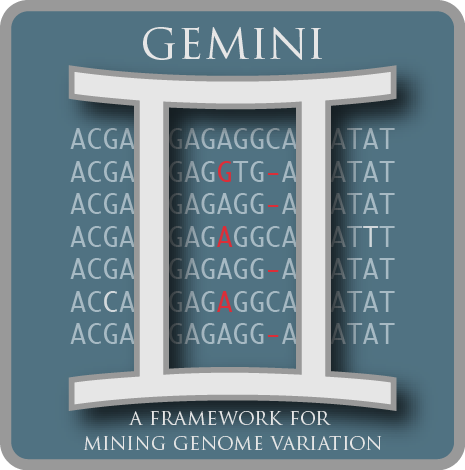 GEMINI is a flexible framework for exploring genome variation.